Training for our men kicks back off tomorrow evening from 6pm on oval A. Please wear pre-season apparel or something blue, those that don’t have a pre-season kit please see Macca as he still has some available for purchase! 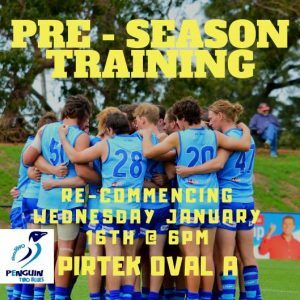 Our senior Women’s team have already got back to business and are training Monday and Wednesday evenings at 6:30pm on oval B. All current, new and intending players are most certainly invited to attend.